I seem to remember someone on here had a good grasp on string tension stuff. I tried a couple of other places on line and got nothing definitive. All else being equal (including scale length, string gauge, tuning): Does a guitar with a trapeze tail piece have higher or lower string tension (because of the longer total string length) than a guitar wiht a stop tail piece (or a pinned bridge). I've heard many people say it's easier to bend strings on a guitar with a trapeze of bigsby, but I think that's a separate phenomenon. What I'm wondering is if the trapeze will make for better sliding? interseting concept -- I look forward to informed replies. I thought there was someone here who had this stuff down. I can't for the life of me remember who. I brought it up on the Facebook slide page and the conversation went 8 directions and nothing definitive. well you could conduct an experiment - if you can get 2 similar guitars with similar strings, one having strings pegged at the bridge and the other having a tailpiece, then you could push or pull or bend strings on both guitars and judge for yourself which set of strings seems to be under greater tension. OR, you could bring the guitars to an archery shop and see will they fit on the machine that measures bowstring tension. There was a table with this info somewhere on the internet. I haven't used it, but here's a string tension calculator that might help out. I haven't been much concerned with this stuff for a few years now, since I'm nearly always playing a National Resophonic these days. Jake, I am not sure what your exact question is. However, I can say this much. and the pitch that the string is tuned to. If you increase any one of those elements, leaving the others the same, the tension will go up. The length of the string going to the headstock and to the tailpiece, if there is one, and the break angle over the nut and bridge will obviously affect the stresses on the guitar, but they will not change the tension on the string. So, I hope that helps, but since I am not sure what you are getting after in the first place, I hope that I am not wasting your time. Thanks guys. That actually confirms that I was completely off. 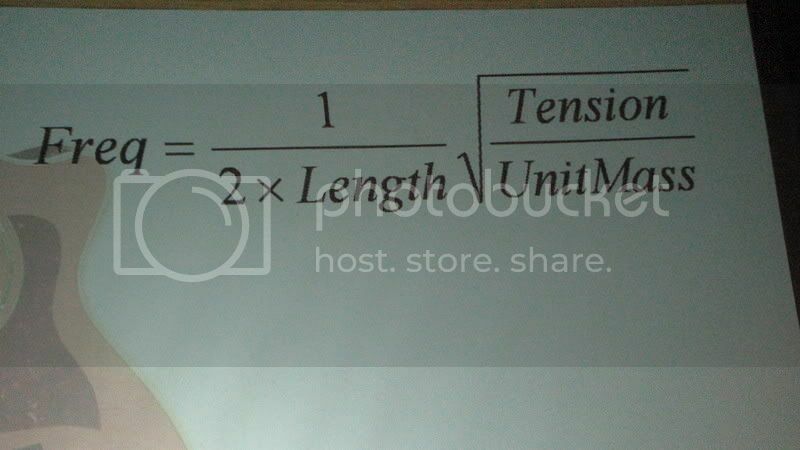 I had read (on the internet, so it must be true, ha ha) that the longer OVERALL length would change the tension, but looking at your description and the tension calculators, this is not the case. Having made various posts about this in several forums, I've had numerous people talk about better "bendability" with a longer overall string length (high strings on a Fender headstock, trapeze tailpiece or top loading bridge on a Tele, etc.). I'm not completely sure I buy that either. The string tension should be the same (again, scale, string gauge, tuning all being equal). THe only thing that might come into play is the elasticity of the longer string but I'm having trouble believing that a little more string will make much of a difference. I built the guitar in question with a sting through tail piece and although I don't have it fully set up yet, I'm perfectly happy with it. I've never been big on tailpieces anyway, other than on a reso or an arch top, where it's really not a choice. Jakeblues wrote: I seem to remember someone on here had a good grasp on string tension stuff. I tried a couple of other places on line and got nothing definitive. Jake, first I am not the person who wrote whatever it is that you are searching for, but if you find it please post a link. I am both an amature builder and an engineer (dangerous combination) and since I build all kinds of instruments with and with tailpieces, I've spent a fair amount of time researching how that affects the way sound is produced in the top (or strings). I can easily Segway this conversation to pinned bridges vs floating bridges, ladder vs X bracing - all that sort of stuff but that is not what you asked. (that is from a presentation at the 2008 GAL conference by D'Addario). The length term in that equation is the vibrating length (either nut to saddle or fret to saddle). For all of the other properties there will be one tension that gives you frequency of the note you want. Third assumption - those other little pieces of string (nut to tuner, saddle to tailpiece or even pins) are under the same tension. In fact if you pluck them they will make a note - high and sharp - but that's just because their length is so short. Fourth assumption, the longer the overall length of the string the more it will stretch as you tune it to the final tension given above. So back to your question(s). For a give distance from the saddle to nut, it doesn't matter whether there is a tailpiece or pins - the tension will be the same. However, for a guitar with a tailpiece it will feel like it is easier to bend because you are stretching the additional length. Yeah Jake, there used to be some folks on the forum that could tell you, any gauge string, tuned to any given note, how many pounds tension it was for your bridge. Now that this place is a ghost town, probably not. The forum is kinda like that town at the end of "Outlaw Josey Wales" . Just s few folks hangin' around.